The bumblebee is the gardener's friend because it is a great pollinator. Bumblebees are bigger than the common honeybee, and more round and “furry”. Like the honeybee, bumblebees feed on nectar and pollen, so planting a variety of flowers and flowering trees and shrubs for honeybees helps their giant cousins, too. We'll share some information on why bumblebees are so important, their life-cycle, and how to attract them to your yard and garden. Wisconsin has over 20 different species of bumblebees. The bumblebee can pollinate plants up to 1.2 miles (2km) away from their nest. Bumblebees are normally quite docile, but the female bumblebees can sting multiple times. (Honeybees can only sting once, since their stinger pulls out of their bodies.) Duncan and Laurie have gently petted bumblebee’s fuzzy bodies on numerous occasions. Stay calm and don't bother the bumblebees, and they usually won't bother you. Bumblebees can vary from ½ inch (1.27 cm) to nearly an inch (2.54 cm) long. Honeybees are generally less than ½ inch (1.27 cm) long. The common bumblebee is a social insect that forms colonies with a single queen. A bumblebee hive will only have 50 to 400 bees at most compared to 10,000 to 60,000 bees in a normal honeybee hive. In general, the queens are 17-21 mm (0.67 – 0.83 in) and workers are 8-16 mm (0.31 – 0.63 in). The shorter lived males are 10-17 mm (0.39 – 0.67 in). “On a bee-for-bee basis, bumble bee species are eight times more efficient than honey bees at pollinating some highly-valued crops like blueberries”, according to researchers from the University of Maine. 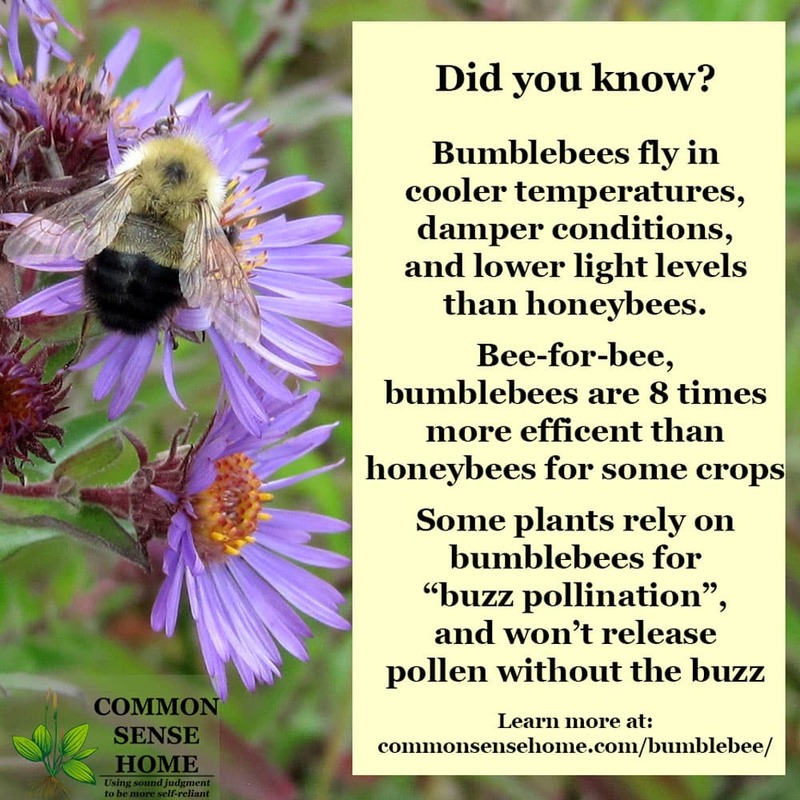 The bumblebees are more effective than honeybees because they will fly in cooler temperatures, damper conditions and lower light levels, which extends pollination by several hours each day. Honeybees also have difficulty pollinating crops like blueberries, which have very little nectar. Some commercial beekeepers are now refusing to pollinate blueberry farms, because the honeybees effectively starve from lack of nectar. Bumblebees and solitary bees are popular in greenhouses, because they are such good pollinators. The bumble bee is good at pollinating tomatoes, peppers, fruit trees and berry bushes and shrubs. The worker female will vibrate her wings while biting the flower stamen. This is called “buzz pollination”, and shakes loose extra pollen, increasing the odds of good pollination. 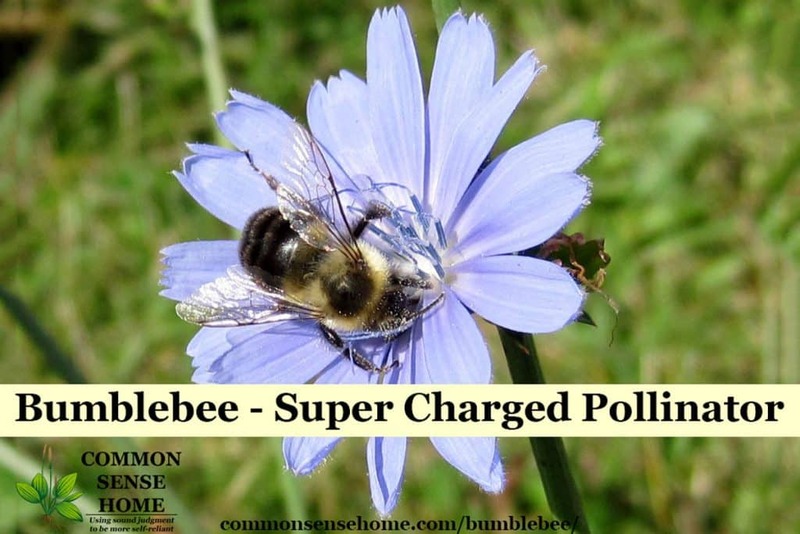 Some plants rely on buzz pollination from bumblebees and won't release pollen without the buzz. 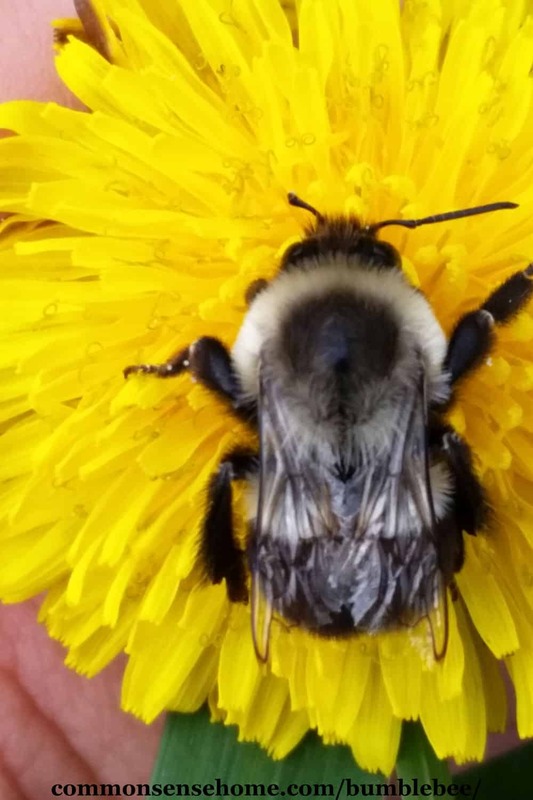 Bumblebees can deal with hot and cold weather better than honeybees. They can control their body temperature by sunning themselves and shivering, and can cool themselves by giving off heat, sort of like a radiator. They are amazing little creatures. Don’t spread pesticides and weed killers. Plant a variety of flowering trees, shrubs, vegetables, fruits and flowers. Plant early, mid and late season blooming flowers, shrubs, berries and trees. The wider the variety of flowers, the better. Planting edible landscaping is a good start. If possible, avoid mowing while the dandelions are blooming. Wait to mow until after they die back. 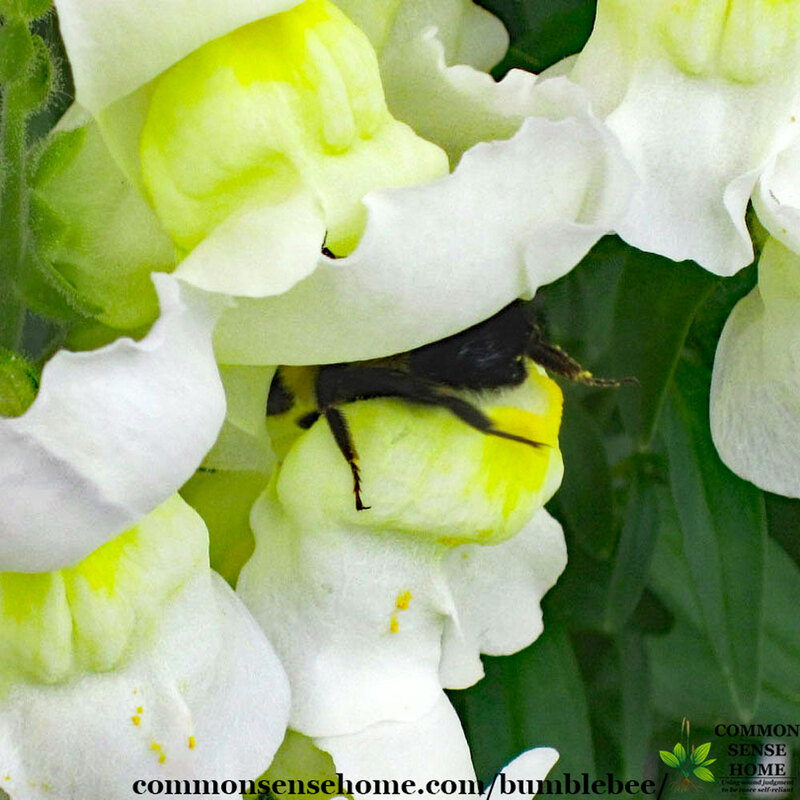 For more information on bumblebee food, see: 5 Tips for a Bee Friendly Yard – Do Your Part to Save the Bees. Bumblebees look for warm dry cavities of varying sizes. They will take over old mouse, rabbit or chipmunk holes, or nest under bent over grass piles, loose mulch, compost or straw piles or bales. They generally want above ground locations. If you can build a birdhouse, you can build a bumblebee nest. Use 1” or ¾” untreated lumber. Create a 8”x 8” x 12” box with an overhang to protect the sides and front. Put a divider inside the large box to create a small entry area and a larger nesting area (about 8 to 9” on the nest side and about 2 or 3” inches on the entry side). The entry hole into the entry area should have a hole that is ¾” close to the bottom of the box. Add a 2nd ¾” hole into the nesting area, again toward the bottom. Drill very small holes into the sides of the nesting area toward the top. The top board needs to overhang the rest of the box so the rain can't get in, probably a 10” or 12” piece of lumber. The more protected the better, BUT you also need the ventilation. Use screws to assemble the box so it can be taken apart for cleaning. There needs to be a few drain holes in the bottom of the nesting box. Place cardboard in the bottom of the nest (it will absorb moisture and simplifies cleaning). Put cotton, string or other soft loose material in the nesting area (about 2/3rds full). Build four at once, because the bees might not like where you place it. Place a few around the yard in protected locations, with the opening facing south. Paint the outside of the bumblebee house with bright colors, so you can find it and clean it if needed each year. If the boxes are still empty in July – pick up the empty box and try a different location next spring. Having a number of boxes will increase your odds of bumblebees accepting one of your nests. When it is warm enough, the queen emerges from hibernation and starts new colony. She builds her nest and lays eggs for the first workers. She cares for those eggs until they hatch and then forages to feed them. Once they start to forage, her job is to lay eggs. Bumblebees like it warm, and the queen will try to keep her nest at 86°F (30°C) for brooding larvae. The nest is usually 5 to 15 cm below the surface, and the opening is often obscured by mulch or leaf litter. As temperatures get colder, she produces a chemical in her body (glycerol) that keeps her from freezing, and she remains buried all winter. In the spring, the queen bumblebee emerges to restart the cycle. You can see a queen bumblebee preparing to hibernate in the video below. 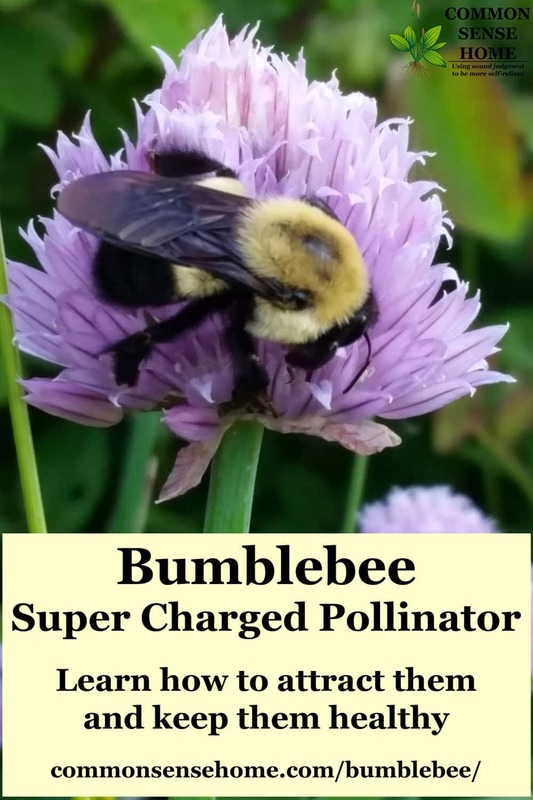 I hope this post helps you to appreciate the humble bumblebee, even though they don't get nearly as much press as their honeybee cousins. Bumblebees and other native bees are critically important for pollination, and we need to do everything we can to protect their habitat and make them welcome our yards and gardens. I’ve always wanted to pet a bumblebee! I’m highly allergic to yellow jackets, but have learned (the hard way) that I am not to honeybees, or hornets in small doses. That has made me wary of all stinging varieties. Ours that patrol the garden are quite used to Duncan and me, and we both keep a very happy and relaxed energy levels around the bees, so I think that helps to keep them calm, too.